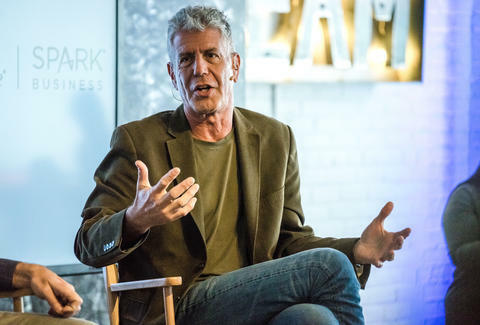 Anthony Bourdain eats his way across the world as the host of CNN's Parts Unknown. And since his gastronomic escapades are essentially his work, Bourdain often toes the line between business and leisure. But for the celebrity chef, who's dined everywhere from Sicily to Libya and back again, time away from the office comes with one very stringent rule that's kind of mismatched with his globetrotting reputation: he never eats at restaurants while on vacation. In a recent interview with Travel + Leisure, Bourdain revealed that when he's on vacation and away from work, he likes to cook for himself. Unsurprisingly, the unvarnished act of firing up a stove and preparing a meal makes the food icon happier than being hounded by paparazzi at a trendy restaurant. "When I’m on vacation, I live a very different life,” he said. “I cook because it makes me happy. I want to forget who I am and I want to go to places where no one knows who I am." Bourdain utterly failed at going unnoticed earlier this month, when he was cornered by TMZ at Los Angeles International Airport. During the interview, the CNN host was asked about North Korea, and let the viewers know that he'd never take his show to the secretive state to film and episode. "Don't you think that'd be kind of bad taste?" he asked the interviewer. Still, there's plenty of places Bourdain loves traveling to, and you'll see many of them on October 1, when season 10 of Parts Unknown journeys to Singapore, the French Alps, Nigeria, Pittsburgh, Sri Lanka, Puerto Rico, Seattle, and southern Italy.